Good hydration: Michael Ritter 08MPH leads an effort to increase safe water. To learn more about Emory’s efforts to aid Haiti recovery, please visit www.emory.edu/home/CEPAR/haiti/. On a Saturday morning in the parched hills above Leogane, Haiti, a truck hauling a thousand plastic buckets rumbles over the sun-baked stones of a mostly dry riverbed, past women bathing in the trickle of a stream and bone-thin cattle grazing on the banks, and on up the mountain to a village called Chalet, where a mule train is waiting in the shade. Meanwhile, in the crushed city below, soldiers bulldoze the rubble-strewn streets, and trauma surgeons work through the night, salvaging what limbs they can. A classmate of Ritter’s at Emory, I had learned about Deep Springs International (DSI), the nonprofit organization devoted to implementing sustainable point-of-use safe water systems that he helped to found, long before the earthquake. Ritter is president and in-country director of DSI, and during the past two years he has come to know Haiti very well, visiting dozens of villages and distributing some four thousand buckets along with a chlorine solution called Gadyen Dlo (Creole for Water Guard). But after graduating, Ritter and I lost touch. I only knew that he was in Haiti, and like his many other friends, I worried when I heard the news. As it turned out, the thirty-year-old native of Pittsburgh was in Baudin, thirty miles south of Port-au-Prince, at the time of the quake, training water technicians by day and spending nights in the rectory of a Catholic church. 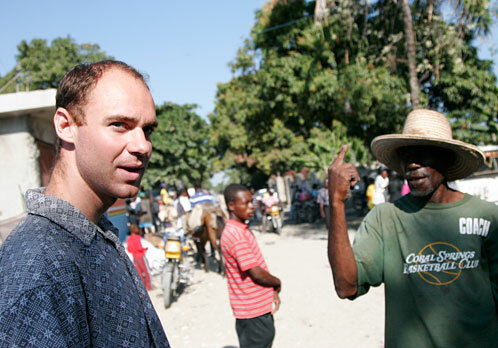 It was nearly a week after the earthquake struck before I made it to Haiti myself. I flew to Santo Domingo, took a truck to a port town farther south, and then hopped a Dominican Navy ship ferrying water and medical supplies to Jacmel, a city of forty thousand on the country’s picturesque southern coast. At the time, media reports, and the bulk of relief efforts, were focused on the devastated capital. But Jacmel had been hit hard—half of its buildings were damaged or destroyed, with thousands buried underneath—and desperately needed aid was only just beginning to arrive. During the next several weeks, I worked with a dozen other volunteers to distribute food and tents, conduct needs assessments, and coordinate civilian aid flights in and out of Jacmel Airport, which we shared with the Canadian Forces. All day, planes and helicopters landed on the tiny runway, bringing in engineers and architects, doctors and nurses, firemen and pharmacists from countries around the world. I spent my first day in Pinchinat, the city’s soccer stadium-turned-refugee camp, helping to set up a medical tent for a Dominican Red Cross team. UN peacekeepers patrolled the sea of makeshift huts—assembled with sticks and bed sheets and scraps of tin fished from the rubble—and Save the Children had begun building a set of latrines. But the medical teams had yet to arrive, and there was nothing in place for seeing patients: no tables or chairs, no tents or tarps or ropes. My job was to find them. As the Red Cross team moved through the camp, a crowd started to gather. There was an elderly woman holding an infant who was too weak to cry, and a small boy, his head wrapped in brownish gauze, who sat cross-legged in the dirt. There were children with hair bleached by kwashiorkor, a type of malnutrition caused by lack of protein, naked from the waist down; men with festering wounds that wouldn’t heal—and everywhere, I was told, the invisible trauma of the mind. Fourth-year Emory medical students Gabe Wardi 10M and Greg Staeheli 10M aren’t doctors yet, but they knew more than enough to lend a hand in Jimaní, the Dominican border town where thousands of Haitians were treated in the days following the quake. Along with Staeheli’s father, an orthopaedic surgeon who runs a free clinic in the Dominican Republic every January, the two encountered medical challenges on a scale few first-world professionals ever see. Emory made numerous and wide-ranging contributions to the Haiti recovery effort, from the dozens of students and health care professionals who traveled to help victims to the varied campus efforts centralized through the Office of Critical Event Preparedness and Response. Emory MediShare, a branch of the nonprofit organization Project MediShare, dispatched an emergency team to Port-au-Prince days after the quake. Alumni on the front lines included Navy Captain James Ware 76OX 78C, commander of the Navy hospital ship USNS Comfort, in essence a floating hospital that anchored in the bay to take in the most severely injured—up to 750 a day. And at home on campus, in addition to fund-raisers, medical supply drives, and educational efforts, a group of Haitian Creole–speaking volunteers were in high demand as interpreters for the American Red Cross’s Atlanta chapter. Back in Leogane, the aftershocks continue to rumble through. But Ritter isn’t leaving any time soon. With the rainy season on the way—and diarrheal diseases on the rise—clean water will be critical to Haiti’s recovery. And as one of the only organizations providing households with access to it in the affected area, DSI will have an important role to play in the months ahead. On our last morning together, Ritter mentioned that the guesthouse he stays in when visiting Port-au-Prince—Ritter has no permanent residence in Haiti, and is constantly on the move—collapsed in the earthquake. “Um . . . you never told me that,” I said.